Four cards total. MINT CONDITION. In other words all of the cards are from pre-rarity symbol sets! There are at least 10 rares in this lot, and it has a low rate of duplication between the cards. The vast majority of the cards are in near mint to mint condition. 1x BAZAAR OF BAGHDAD Arabian Nights 1x CITY OF BRASS Arabian Nights 1x WHEEL OF FORTUNE Unlimited 1x GAUNTLET OF MIGHT Beta 1x ALI FROM CAIRO Arabian Nights 1x MISHRA'S FACTORY Antiquities. Four of the magic cards shown above (if you increase the quantity to "2" or "3", you will receive eight or twelve of these cards). They have never been used and they are in perfect or nearly perfect condition. This item is a PR0XY. You get the item listed in the title. The cards are english and the condition is near mint or better, unless otherwise stated in the title. - Bankdaten für Überweisung sind hinterlegt. Überweisungen werden bevorzugt (behandelt). Account information is deposited (else ask). 1x Lightning bolt. langue: VO English. MTG, Ixalan Block Bundle, 500+ Cards Inc. Rares & Foils! 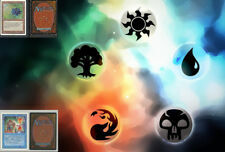 W/ Land Pack. This listing is for over 500 cards from the Ixalan Block, shipped in the Rivals Of Ixalan Bundle Box shown. Included is; 350 Commons, 250 from Ixalan & 100 from Rivals of Ixalan 100 UnCommons, 75 from Ixalan & 25 from Rivals of Ixalan 15 Rares, 10 from Ixalan & 5 from Rivals of Ixalan 5 Mixed Foils, Commons and UnCommons from both sets. 40 Tokens, 35 from Ixalan, 5 from Rivals of Ixalan As well as a sealed 80 Card Land Pack from Rivals of Ixalan, and a dice stamped with the set symbol. The cards shown in the photo are for demonstrative purposes only, I can’t guarantee you will get exactly what is shown in the photos. Note: not to be mistaken with the Ravnica Allegiance prerelease event code, which grants you a ticket to enter an MTG Arena Competitive Draft Event. 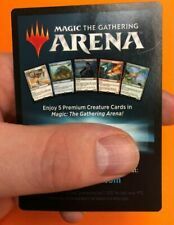 ANY MTG Arena Sealed Event (normally 2,000 gem entry fee) of your choice.May only be used once per account. VO: card in english. bon jeu a tous. Cards can range from any set in MTG history. There will be no more than 4 copies of any one card in each lot. There will be a good variety. 50 Card Sliver Lot. We are located in Las Vegas, Nevada. 1x TARMOGOYF 1x KARN LIBERATED 1x MOX OPAL 1x LILIANA OF THE VEIL 3x LINVALA, KEEPER OF SILENCE About the item. All the cards are in English. The cards are in perfect condition (Between NM/Good). Alle gekauften Karten. Mint (Mint): Die Karte ist absolut makellos. Nearmint (NM): Die Karte weist minimale Gebrauchsspuren an den Ecken, Rändern oder der Oberfläche auf. Excellent (EX): Die Karte hat mittlere Gebrauchsspuren. Ich akzeptiere. (das Bild zeigt nicht unbedingt einen Originalscan). der Zustand der Karte(n) istmint bisnear mint. Big Parcel 19.00 EUR. the price is for the quantity of cards that is given in the title If anything is unclear, just ask. 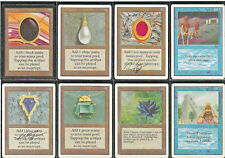 Vintage Magic MTG repacks lot Alpha Beta Unlimited 3rd only - 93/94 ONLY!